In my Maternity Leave (Q4) Income Report, we’re looking back on what worked, what didn’t, what lessons we can learn and how we can best move forward to achieve our dreams. I’ll also share my business strategy and tips that helped me earn $58,000 blogging while on maternity leave. Welcome back to Root + Revel’s traffic + income reports! You might remember back in January 2018 we published our very first income report–it was actually for the entire year of 2017 (hint: I earned over $75,000 blogging in my second year!). It’s hard to believe it’s already been a year since I first hit publish on that post, and even more amazing that my income went from $6,500 in my first year of blogging to over $75,000 in my second year and most recently to $150,000 in my third year! That’s right–in 2018, I earned $150,000 from my blog. Even crazier? I took 4 months off (September through December) after I had my first baby as maternity leave. And because of the systems I set up prior, I was able to earn $58,000 while on maternity leave. Seriously! I worked less than 10 hours a month (mostly just staying on top of emails), but the money just kept coming in. It’s a miracle, a dream come true, a testament to the fact that hard work and planning and strategic hustle pay off! I know this might seem a little crazy to you–or perhaps you’re just here for the food (might I recommend these chocolate peanut butter bombs to hold you over), but let me explain. Before we get into the details, I also wanted to share my traffic totals for Maternity Leave (September through December, Q4-ish). Hourly Rate: This one is a bit hard to calculate since I was technically not working as I was on maternity leave. But I did keep up with emails, more or less, and check in with my assistant Sarah, so I’d estimate I worked about 10 hours per month. That would mean, I worked on the blog for a total of 40 hours in Q4-ish (September through December). With a gross income of $57,964.58, that means I earned roughly $1,450 per hour. WHAT?! How crazy is that??? If you look at my net income instead, my hourly rate drops to about $850/hour, which is still WAYYYY above my goal of $100 per hour. This is super exciting–it took a lot of planning and working ahead and hustling before maternity leave to make this happen, but it feels BEYOND AMAZING to know that I was able to step away from my business for 4 months and still make great money. Honestly, I’m in shock! Running a blog is a TON of work and each month I feel like I could fill an entire notebook with “what I focused on” details. But for everyone’s sanity’s sake, I’m going to keep this list simple and straightforward, which is fairly easy to do considering I technically was on maternity leave during this time. Other days, I’d see important emails come into my inbox, or my assistant would have a pressing question and couldn’t do her job until I answered it, or (if I’m being totally honest), I’d just get bored. Newborns sleep…A LOT. And I’d feel like working, so I’d think to myself, “what’s the harm? I should just do it!” And sometimes I did give in to that urge. But mostly I tried to remind myself that this was one of the most fleeting, important times of my life–never again would I have just one baby to care for, my first child to spend uninterrupted, quality time with, without other kids or distractions, my very first maternity leave and the only one where it would be just the two of us. I knew I would never look back on it and wish I had spent less time with my baby and more time working. So I really tried to prioritize and only do those tasks that were absolutely necessary and/or soul satisfying. How was I able to take this much time off and still make great money? Well if you’ve been following along then you’ll remember that I spent most of the year writing content in advance, preparing to take this time off and Sarah and I had to super hustle, especially in Q3 in order to make this happen. We scheduled tons of blog posts, email copy and social media posts in advance. We updated and republished seasonal recipes to keep the blog looking fresh. And Sarah was still working part-time while I was off, so anything that came up during this time, she basically handled. My angel! I officially came back to work the first week of January and I have to say, though there have been some overwhelming moments as I’m getting caught up, I’m coming back newly energized, motivated and so excited for everything 2019 has in store. Helping My Readers: Of course I couldn’t talk about goals without mentioning my entire reason for being–serving you, my dear readers! Helping you get healthy food into your bodies, nourishing your family and your nest, learning more about how to live a more vibrant, balanced, meaningful life is my #1 priority at Root + Revel, and that will NEVER change. Yes, it’s a business and yes, I need to make money from it to support my family. But providing service to my readers, helping them achieve their best health, is always the main goal. Nothing fills my soul with more joy, purpose and satisfaction than knowing I’ve helped someone. Really and truly. Passive Income: If this maternity leave taught me anything, it’s that passive income is quite possibly the best thing about blogging. I’ve never had a career before that would allow you to step away from work and keep earning money. But thanks to our library of content that’s filled with affiliate links, product sales and ads, I was able to do just that and continue earning. So I plan to continue harnessing those avenues, like affiliate marketing, that build up our passive income streams. Beautycounter: Speaking of affiliate marketing, there is one brand in particular that has really resonated with me over the years and one that I want to focus on most in 2019. That brand is Beautycounter and essentially it’s an MLM. But it is possibly the only company that I would even consider joining as an independent sales rep because I a) believe in their mission 100% b) absolutely love and use their products every single day and c) know will help others reach their best health. Bonus points: they have an amazing commission structure that allows you to not only earn up to 35% on all sales, but also to earn additional commission from your team’s sales AND get 25% off all products for yourself. In 2018, I only made $1,415 from Beautycounter, but with my new strategy in place, my goal is to make at least $2,000 per month from the program. I’ll continue to keep you posted in future income reports, but in the meantime, if you’re interested in learning more about Beautycounter and/or becoming a consultant, I’d love to talk with you about joining my team. Let’s chat! Comment on this post or email me (kate[at]rootandrevel.com)! Course Launch: And speaking of passive income, my goal is to FINALLY launch my Blogging Business course in Q1 of 2019. I hoped to launch it last year, but with having a baby, certain things got pushed to the back burner and I didn’t get around to completing this. But it’s over 3/4 of the way done and I anticipate launching it very soon. Stay tuned! Sticky Website: In November 2018, we launched a brand new redesign of Root + Revel, the first time it’s been updated since we launched back in October 2015. It was a looooong, expensive, time consuming process, but I couldn’t be happier with the makeover and I’m already starting to see some great results. I’m going to continue monitoring some key metrics (like pages per session and time on site) to ensure the design is functional, as my goal is to get people to stick around more, read more posts, click on more pages, and really read the content, rather than just skimming. Take a look around and let me know what you think in the comments below. Grow Traffic + Followers: Of course reaching more people continues to be one of my goals for 2019. In 2018, we had nearly 1 million unique visitors come to rootandrevel.com. That BLOWS ME AWAY!! I’ve heard it’s helpful to picture those actual people in a room that you’re speaking to, and when I imagine 1 million people listening to what I have to say, I am overwhelmed with gratitude. I hope in 2019, we’ll continue to grow and reach even more people, helping newbies heal their bodies and live their best life! Thank you for another fascinating income report! I’m curious to know what you are doing for Pinterest promotion now that Boardbooster has gone under. Did you switch to Tailwind? Do you have an admin help? I love my Pinterest traffic and am always looking for ways to grow it – but it takes quite a bit of time and effort! Great question! The loss of Board Booster was such a bummer, especially as we had just spent many hours crafting our strategy there. And I loved the looping feature where you could “set it and forget it”, rather than having to spend time every month pinning new pins. BUT then Tailwind announced their Smart Loop feature, and I think this could be a great replacement. To be honest, we haven’t spent enough time honing our Pinterest strategy, but I plan to make that a focus in 2019 (will help us achieve the goal of growing traffic from above) and am looking for some courses and/or management companies who could help us. If anyone knows of any, please share in the comments below! Likewise, for next month, please leave a comment below if you have a question that you would like me to answer. 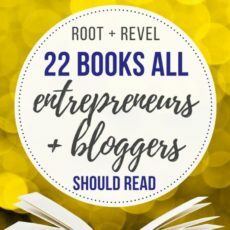 Please know, I am keenly aware that I have the flexibility, freedom and finances to work on this blog as my full-time job because of YOU–dear reader, sharer, Pinner, commenter, Liker, customer or silent follower of Root + Revel. Your support and participation in the R+R community reaches beyond just this website. This month, I donated $500 to Real School Gardens (now Out Teach) in your name. This amazing organization helps kids get healthier by developing in-school nutrition curriculums and building school gardens. By combining academics with experiential outdoor learning, Real School Gardens has shown to increase standardized test scores by 12-15%, and increase teacher effectiveness and job satisfaction by a whopping 50%! « Previous PostToxic Herbicides: Glyphosate Dangers + How You Can Help! This is such a fantastic post Kate, and so inspirational. Thank you so much for sharing. As someone who dreams of escaping the standard 9 to 5, it’s so motivating to see people like yourself who are doing so well and are willing to share your learnings. I hope that one day I will be in a situation where I can do the same. If I can do it, you can do it, Jen! Really happy you’ve found this inspirational – that’s exactly my hope in sharing all this. Let me know if there’s anything I can do to help you with your goals! This is so inspiring! It’s so helpful to see how it’s very possible to make money at something you truly love while being able to mom full-time. Thank you so much for posting this to help others. Your little bundle is absolutely adorable! How wonderful it is to be able to spend this precious time together. Thank you for your kind words and really happy you found this inspiring, Amanda! Thank you Kate for being so transparent. You are such an inspiration to us working moms who would love to work for ourselves and spend more precious time with our families. I would love to hear more about beautycounter and possibly become a consultant. Their story resonates with me as I’ve been searching for cleaner beauty products. I was so happy to click on your site and see a new income report that I had to pause everything and make myself an espresso. This is very inspiring Kate and really solidifies my own thoughts around focusing on passive income first and also serve, serve, serving my audience. I would love to hear more about your email marketing strategy in a future featured question. I follow along and take note of how often you send out emails, and how to implement those strategies for my own list but I feel like I’m emailing them too much even just twice a week! Any insight into your system would be helpful, I geek out on segmenting and analytics so this is a big interest area. LOL!! Wow, thank you for being so interested in these reports! 🙂 We email 3 times a week (sometimes 4!) so definitely don’t hesitate with two emails/week. As long as readers know what to expect (i.e. you tell them up front how often you’ll email), it’s totally fine and they can just unsubscibe if they don’t like it (in which case they’re not your ideal readers anyway!). We can definitely talk more about email marketing strategies in a future post. Thanks for the question, and we’ll be getting back to monthly income reports this year!